If you have a large family, then having a back up refrigerator or freezer is a good idea. Typically, these units would be tucked out of the way down a basement or out in the garage. They help when you buy foods in bulk and need to keep them frozen. 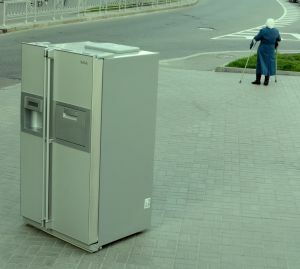 What doesn’t work is having a spare refrigerator that doesn’t work. Often, folks replace a broken fridge and just shove the old one out of the way. Unless you remove the door or put a lock on that unit, it is major hazard. A better option would be to have it hauled away once and for all. That is an easy task for Junk King San Diego. Junk King San Diego specializes in hauling away all those oversized items you want to get rid of. They provide the manpower and the truck. Imagine if you had to pull together your own crew and rent your own truck. That’s several hours of work right there. Then there is the issue of where would you take the fridge once it is loaded. That could mean spending several hours back and forth in traffic. Instead, Junk King San Diego can pick up the fridge, load it in literally just a few minutes and be done. You won’t have to lift a finger. Even though your primary concern is to get rid of the refrigerator, the crew from Junk King can do so much more. Take full advantage of that team and have them haul away all your unwanted clutter including sofas, futons, recliners and loveseats. They can even take apart a pool table or entertainment center to get it out the door and onto their truck. Before the crew starts any loading, they’re going to provide you with an estimate based on volume. It all comes down to how they’re going to pack up the truck with your stuff. The less space they use, the less you’ll have to pay. As for scheduling, Junk King makes that easy, too. On call puts the plan in action. The best way to handle refrigerator disposal and junk hauling is to give that task to Junk King San Diego. This entry was posted in San Diego junk removal and tagged junk hauling, junk King, refridgerator on November 30, 2017 by Junk King. Last updated December 4, 2017 .